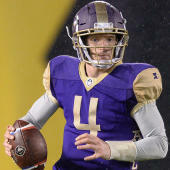 Just like that, the AAF regular season is about to be halfway over. Having such a compact season is smart for a start-up league, but it'll also be over in the blink of an eye. Careful if you do, though. Week 5 might be a don't-miss slate. Sunday's action is about to get underway. Memphis and Atlanta play in the battle for "not last in the power rankings" followed by two enigmatic teams, San Antonio and Arizona, in the evening game. Here's everything you need to watch and enjoy Week 5 of the AAF season. Memphis at Atlanta: Chortle at a game of bottom dwellers if you must, but thank the high heavens the Express and Legends notched their first wins in Week 4. Otherwise, this might have been really sad. Besides, it's clear both teams have improved and it's no coincidence that changes at quarterback have played a part. Originally coming off of the bench in Week 3 for Memphis, Zach Mettenberger has quickly become one of the most efficient passers in the Alliance. And in a Week 4 win at Arizona, Atlanta's Aaron Murray came off the bench to compile 308 yards of total offense. Which one leads their team to victory in Week 5? San Antonio at Arizona: I can't think of two teams in the AAF who have either looked playoff-worthy or flown entirely off the rails like Arizona and San Antonio. So this game should be interesting! That being said, Commanders running back Kenneth Farrow has been a beast and is emerging as one of the top running backs in the Alliance. Between him and Trey Williams, the Commanders have been a better ground-and-pound offense as of late. However, even through its two-game slide, Arizona's defense remains one of the AAF's best.